Decade is made from a pink material covered in sparkly bits. She has black button eyes and a larger black button nose. She wears a multicoloured ribbon tied around her neck and a “10 Year Anniversary” button on her chest. Beanies would put a smile on their faces! Decade was released on 1st July 2003. Decade is available in 10 different colours. These are brown, gold, green, dark blue, light blue, pink, orange, red, white and purple. The Decade bears were made to mark the 10th Anniversary of the Beanie Babies range. The first decade bear was spotted on 16th February 2003 at the New York City Toy Fair. 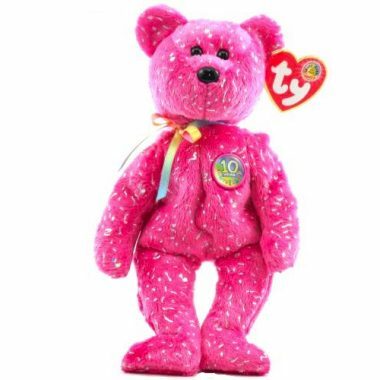 This pink version was Beanie Baby of the Month for July 2003. Ty Warner personally signed 100 of the Decade bears. Decade retired on 1st August 2003.